Some friends came together to craft up a labor of love song for a musician's birthday. The title of the song is itself a testimony to what they're doing. Enjoy this labor of love! Songs are buoyed by the spirit of the invisible stories behind it. This week's feature is an serendipitous friendship between Ashwin the poet, Bhumika the singer and Nimo the rapper. Last December, they met at an "inclusion retreat" near the Gandhi Ashram. For most of his life, Ashwin has been wheelchair bound but that has hardly stopped him. Bhumika used to sing professionally but for most of the last decade, she has only sung when moved by love -- sometimes while strumming her guitar. And Nimo is a rapper, who has spread songs of hope to many around the planet. It so happened that it was Nimo's birthday this month -- and as a gift for him, Ashwin wrote up a song, Bhumika huddled up bunch of her friends, and Gundarshanam was born. 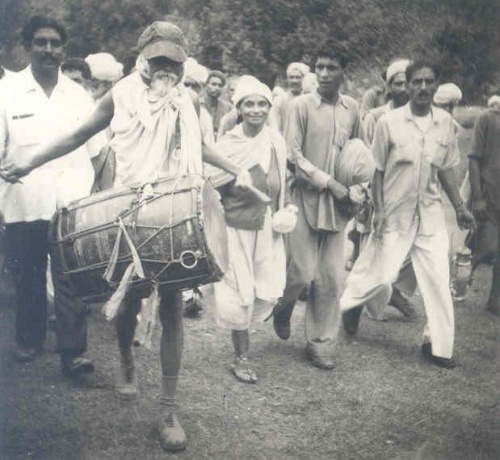 The concept of the song originally inspired by Vinoba Bhave, who used to say that there are four kinds of people -- those who only see the bad, those who see the good and the bad, those who focus only on the good, and those who amplify the good. "We should always aim for the fourth," he would say.